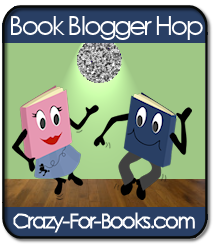 This is my second week doing the Book Blogger Hop, hosted weekly by Crazy For Books. Be sure to stop by her blog to check it out! This week's question: What book-to-movie adaptation have you liked most? Which have you disliked? My favorite book-to-movie adaptation is definitely Harry Potter. I think they've stayed pretty true to the books, and I think all the actors are perfect in their roles. As for ones I haven't liked - and I'm sure I'm going to catch a lot of flack for this - the Twilight series, with the possible exception of Eclipse. It's not that I don't like the movies per se, it's that I think most of the actors are so painfully bad that they butchered the movies. By Eclipse, some of the worst of them seem to finally be learning to act, so I have some hope for Breaking Dawn. One movie that I thought was actually better than the book - not something I say often - is The Notebook, based on the book by Nicholas Sparks. I saw the movie first - again, not something I normally do - then read the book and didn't really enjoy it that much. I had a few other people tell me the same thing, so I know it's not just me. I'm joining another new weekly theme this week: Follow Friday Fun, hosted by Parajunkee Check out her blog for details/rules and to join! This week's question: How many books do you read in a week? And in what format do you read them, or listen to them? How many books I read depends on how long they are and how much time I have during the week, since I'm the slowest reader in the world. On a good week, I can read two small-to-medium sized books. If they're really long, it might take me an entire week, sometimes longer. It also depends on how good they are - if it's something really good that I can't put down, I seem to be able to read faster. Go figure. I read all my books in actual book format since I don't own an e-reader, and I think my mind would wander if I tried to listen to audio books. Happy Friday, everyone! Have a great weekend! I'll be back tomorrow or Sunday with my latest Library Loot post. Be sure to leave me a comment to let me know you were here, and I'll be sure to visit you in return! I haven't read HP but I saw the first three or four movies and they were good. I agree with you on Twilight movies, a lot of acting isn't good. I loved the Harry Potter movies as well. I've only read the first book though. I wasn't a huge fan of the first book, but I hear they get better so I really need to keep reading them. Thanks for stopping by my blog hop/follow friday as well! Yay, I'm so happy you also believe that the movies based on Nicholas Spark's books are better. So far it's 3 for 3. I love your blog and am your newest follower!! Honestly, I cannot remember Meyer's books well enough to say whether I thought the movies followed them very well. To me, both were extremely forgettable. It's nice to see that someone else reads at about the same pace! Everyone reading 4+ books a week was making me feel as though I was falling down on the job! Ack! I agree with Harry Potter, good answer. Hopping by from FF. I'm glad there's somebody else who doesn't have an e-reader. I was starting to feel like i'd missed something. You really should try an audiobook sometime, you might like it. I think audios are particularly good for keeping alert on long car trips. I have issues with books made into movies! I'm glad to have found your blog! I'm a new follower. I'm able to read around 2 books a week unless I am very busy and then probably only 1. I usually average about 75 books a year. Totally agree with you on Twilight. The acting is SO bad. You're not alone at all on this one!